Ariel Donovan has been doing her best to move on with her life since her best friend, Jenna, disappeared one night. The beginning of Ariel’s sophomore year of high school means a fresh start, and it brings new people into her life: Theo, with whom Ariel strikes up a friendship, and Henry, the enigmatic newcomer to Hawthorne High. Ariel can’t stop wondering what happened to Jenna, though, especially when she begins dreaming about Jenna and the town’s abandoned, creepy orphanage. Ariel becomes determined to find the connection between the two and to discover what else lies hidden in her hometown. When a book takes place in a town called Hell, like Gravity does, my attention is instantly grabbed. The residents of Hell like playing up the name, too, going all out for Halloween to live up to its moniker. Hell is also home to the abandoned Dexter Orphanage, which has a shady history and is to be turned into a haunted house attraction. 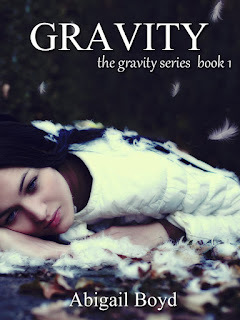 While Gravity boasts an eerie atmosphere that holds the promise of a chilling tale, flat characterizations and a plot that doesn’t quite come together overshadowed everything else about the book. I never got a good sense of what kind of character Ariel, the protagonist, was, other than she was on the bottom rung of the social ladder at school. I found her narrative voice rather dull, like she was just relaying her observations of what was going on around her instead of sounding like she was an active part of anything. Ariel’s friend, Theo, was much more interesting to read about; she had personality and depth and stuck by Ariel’s side. In contrast, I couldn’t get much of a read on Ariel, which made reading from her perspective frustrating at times. Ariel’s love interest, Henry, was even tougher to figure out. I’m all for guys with an air of mystery to them, but Henry was a roller coaster of moods. First he’d act all charming around Ariel, even volunteering to tutor her in math. Then he’d appear to be on super friendly terms with Lainey, the school’s resident mean girl. Then Henry would appear to be very interested in Ariel again. Their relationship was like watching a tennis ball bounce back and forth over a net. Even when Henry was in Pay Attention to Ariel mode, though, I just couldn’t find any chemistry between the two. The pacing made this a long read for me. There were a lot of hints that something creepy was underfoot, but they never amounted to anything significant. I kept waiting for things like the reluctance of Ariel’s parents to talk about her grandmother and the suspicious behavior of her school’s principal to be explained, but I waited in vain. I also couldn’t buy the villain’s identity; it was definitely a surprise, but I didn’t feel like there were enough links to tie this person to the deeds in a way that was logical to me. There isn’t much offered in the way of a motive for this character’s actions, either, which left me pretty puzzled over the whole matter. Overall, I thought there was a great deal of potential here for a chiller of a novel, but after finishing the book, I felt like nothing had really happened. I would have loved to have read more about the spooky orphanage as well as seen it utilized more in the story. Most of all, though, I wish that I’d been able to connect with Ariel. I don’t expect a series to spill all of its plot details in the first book, but I do assume that each individual book in the series will have a definite beginning, middle, and end. Gravity read like a prolonged exposition to me, and that just didn’t work for me. Grr. There have been a lot of spam comments lately, including several that Blogger's filter actually did catch. What kept me reading was the hope that a big plot twist was coming and/or something really scary would happen because I felt like the setup for those things was there. I was disappointed when neither panned out. Great review, Lee. I'd struggle to read a book that seemed mainly exposition. BTW, your Blackbrooke The Guardian widget made me jump! lol. my mouse went over it and I was like "Argh! waaa?" I didn't know the widget made sound, either, until I moused over it and this monster noise came blaring out of the speakers, lol. It's quite fitting for the book, which I'm currently reading, because the story is pretty scary! Yep, sounds like a pass for me as well! Sometimes a book just doesn't click, and that's what happened with this book and me. Ooh yeah, that summary and your initial description of the premise was already reeling me in! Too bad it didn't end up actually being as good as it sounded :( Flat (or confusing) characterization is a pretty big detriment (to me anyways) for overall enjoyment of a story. Plus the slow pacing have me thinking I may pass on this one, but I enjoyed reading your review all the same! The characters just didn't have any traits that made them especially memorable. A quirk here and there didn't quite cut it for me. Bummer...the blurb makes it sound promising. I've read a couple of books lately with this same problem. They are like prolonged prologues. It's all build up and no delivery. I kept hoping that the build-up in this one would lead to a dramatic payoff, but that didn't happen, which was a letdown because the premise was intriguing. Oh wow, this one definitely seems like it has quite a bit of potential - just like you mentioned with the town name and the eerie atmosphere. Such a shame that there were all those factors that made it fall short. Great review! Jaclyn @ JC's Book Haven. Whenever I thought that I was finally getting to the heart of the plot, it seemed like a new piece of information would be introduced, and this kept happening until the end of the book. One of my biggest pet peeves is when author's hint at things throughout an entire book, only to leave them unresolved or have them be something super insignificant; it's just creating suspense for the sake of creating suspense! There were a lot of loose ends here, some of which popped up near the very end of the book, and I'm the type of reader who needs a sense that the book has reached an ending, even if it's part of a series.